This was the 45th conference. It is a unique event, much treasured, and always with a wealth of content. Over the years it has moved from talk to tunes, and both were in the mix this year. 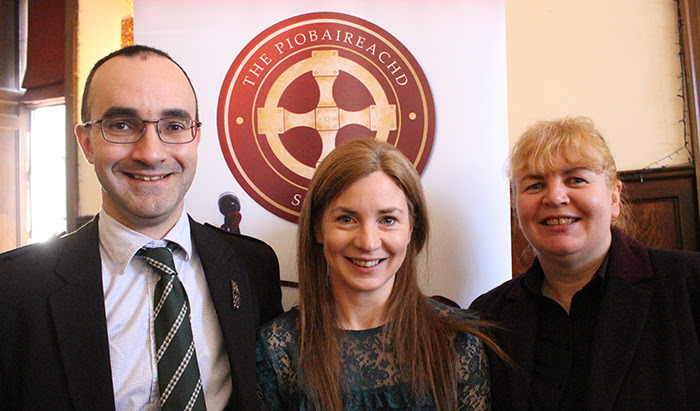 Exerpts of 30 piobaireachd were played, old and new. The fiddle was introduced too, help ma boab. Was there a small seismic tremble? Vice President Robert Wallace opened with “Angus MacKay Revisited”. In an eloquent and reasoned talk he explained why Angus MacKay’s transcriptions are still played today. His music is a refinement of what has gone before, and can be compared with the impact Willie Ross’s collections have made in light music. He sees Angus MacKay’s transcriptions as being more musical, and illustrated this with the start of MacDougall’s Gathering. The National Piping Centre’s CLASP (competing league for amateur solo pipers) initiative. was explained by the organiser, Margaret Dunn. The amount of thought and planning involved was clear, with even an “app” being available for members, and the numbers particating is evidence of success. The inevitable stumbling block of members competing in open highland games competitions was raised. At the moment they can’t. Surely there must be a way round which would help players, and highland games often struggling for numbers. Grade 1 and grade 2 champions Gordon Hislop and Gill Cairns played Macleod of Raasay’s Salute and Too Long in this Condition showing the high standard the league has encouraged. 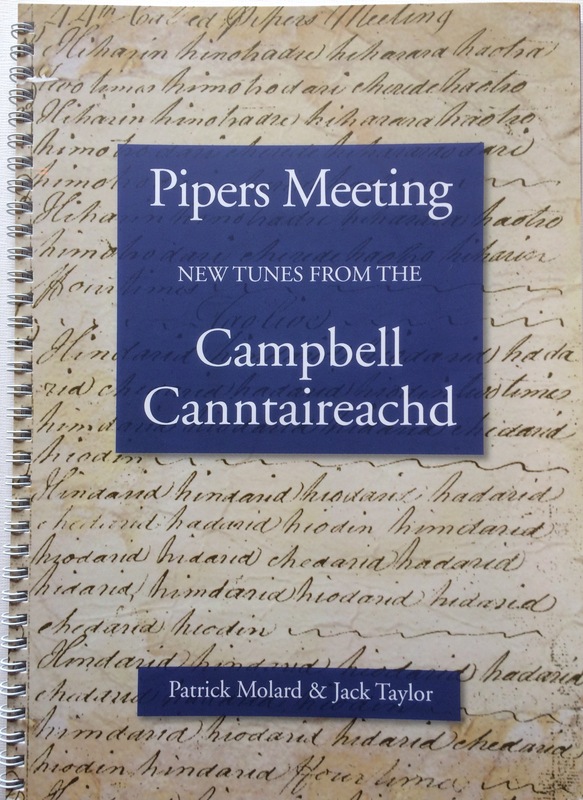 A fanfare of blaring horns, bells and whistles greeted the launch of “Pipers Meeting, New Tunes from the Campbell Canntaireachd” by Patrick Molard and Jack Taylor. Well we knew it was important…. but it was only an SNP demonstration passing outside the huge picture windows of the banqueting hall. Patrick and Jack demonstrated parts of 12 of the 45 tunes in the book, emphasising different features such us irregular phrase lengh, unique crunluath variations, and musicality. Here is Jack with the title tune, Pipers Meeting. A popular addition was the session on Fiddle Pibroch, led by Pete Clark, Birnam’s renowned fiddler and Neil Gow expert. For the pipers benefit he started with 3 tunes with whisky in the title. Funny how they are all fiddle tunes. Then came MacIntoshes’ Lament, from one of the early fiddle manuscripts. Spellbinding. In Too Long in this Condition, in the guise of The Duke of Atholl’s March from Daniel Dow’s MS, which predates the first pipe Piobaireachd collection, Pete was accompanied by Iain MacInnes on smallpipes. Tunes played after dinner were Battle of Auldearn 1 (Robert Frater), Kings Taxes (Peter McCallister), Desperate Battle (Stuart Letford), Hector Roy MacLean (Alan Forbes), Hail to my Country (Walter Gray), Sisters Lament (Patrick Molard) and Duncan MacGillvray with a group of fine marches from Patrick MacDonald’s collection, and one he composed for his father, gold medallist and gentleman Donald McGillvray. and Cronan Padruig Seamus, John Frater, admitting unsettlement by an unexpected pipe problem the night before, with Ronald MacDonald of Morar, Beloved Scotland and Hail to my Country, and Society Secretary Bill Wotherspoon with fine renderings from Princes Salute, Lady MacDonald’s Lament and Roderick MacDonald’s Salute. At the AGM the health of the society was noted, with membership subscriptions now overtaking income from books, and all income going out to piping causes. There is a low uptake of electronic books, and this is being looked at. The question of attracting younger enthusiasts was raised. Several ideas were generated, which will all be followed through. Alan Forbes has become Chair of the Music Committee, after many years as hard working and meticulous secretary. Andrew Wright and Dugald MacNeill have stood down from the General Committee. The President led hearty applause in thanks for their dedication over many years. The Society’s debt to past President David Murray was recorded. Full proceedings including video on YouTube will follow.